Some of the photos presented here are available to download in a high-resolution format suitable for press-printing. For more photos from our Gallery, click here. 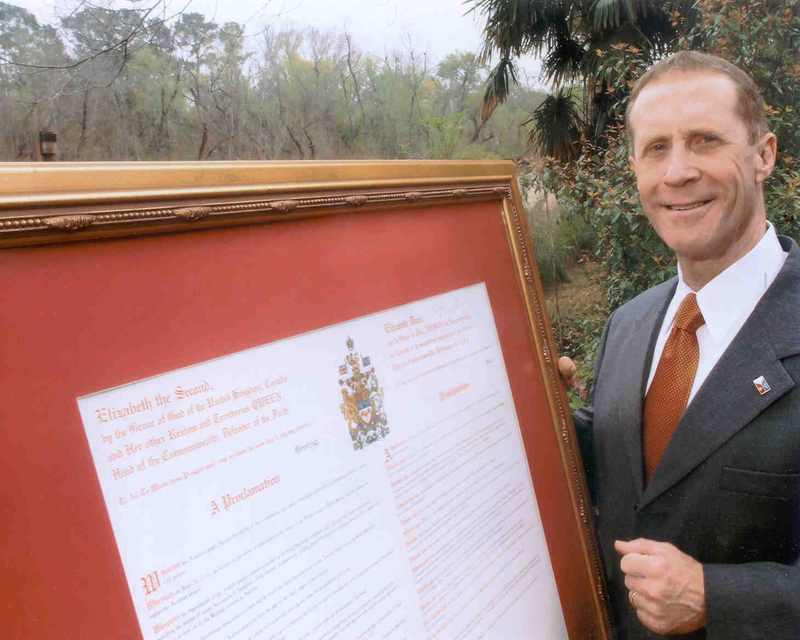 Warren A. Perrin shown with the Queen Elizabeth's Royal Proclamation which, for the first time, acknowledges the historical wrongs done to the Acadians by the Crown and establishing a "Day of Commemoration" on every July 28th. Shown in Lafayette, Louisiana on June 28 at the University of Louisiana Alumni House during the Council for the Development of French in Louisiana's (CODOFIL) State Bicentennial Fundraiser are (L to R) Warren A. Perrin, Governor Jindal's appointee to the CODOFIL Board of Directors; Kim Doucet, public relations representative of the Acadian Museum of Erath; The Honorable Francois Delattre, French Ambassador to the United States; and Kermit Bouillion, member of the Lafayette Parish School Board representing District 5. On January 23, 2008, Buford Jordan, former New Orleans Saint's football player, helped to promote "Acadian Redemption" in New Orleans. (L to R): Warren A. Perrin, Buford Jordan and Kermit Bouillion. Dinner with Consul General of France . Warren and Mary Perrin represent the Acadian Museum in Paris, France. Marquis De La Fayette is inducted into The Order of Living Legends in Henry, Louisiana. Warren Perrin is inducted into the Louisiana Justice Hall of Fame. Kermit Bouillon and Warren Perrin presentation on the River Barge Cajun Country Excursion. Louisiana signing Accords with Belgium (L to R - seated): Philippe Suinen, Commissaire général aux Relations internationales de la Communauté française de Belgique, (standing) Linda Johnson, President of the BESE Board and Warren A. Perrin, President of CODOFIL. Click Here to visit our Picasa albums page, with larger versions.